During today's annual stockholders meeting, Apple CEO Tim Cook revealed (via Bloomberg) that 40 billion iMessages and 15 to 20 million FaceTime calls are made daily. 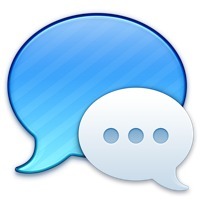 That number suggests iMessage has grown exponentially over the course of the last year as usage numbers were at two billion messages per day in January of 2013. As of mid–2013, Apple had 320 million iCloud accounts with 900 billion iMessages sent, a number that would be significantly higher today, taking into account 40 billion iMessages a day. In comparison, popular messaging service WhatsApp, which was just purchased by Facebook, processes 50 billion messages per day. BlackBerry Messenger users on Android, iPhone, and BlackBerry phones send and receive upwards of 10 billion messages per day. iMessage and FaceTime have become increasingly important messaging services for Apple over the course of the last year, and the company recently enhanced FaceTime with FaceTime Audio for both iOS devices and Macs, putting the video service on par with other apps like Skype. During the meeting, Cook also announced impressive Apple TV sales numbers topping $1 billion and said the company had not lost its "innovative DNA." Update 12:46 PM PST: According to The Wall Street Journal reporter Daisuke Wakabayashi, Apple CEO Tim Cook told shareholders that the company processes "several billion" iMessages per day, with the 40 billion number referring to notifications. I guess it shows just how many people live inside Apple's little walled garden! FaceTime, working just like a phone call (video or just audio) with zero config needed, and ringing all my devices at once, is the greatest thing since sliced bread. And cheaper too! If you consider each message to be 160 characters at 7 bits per character, that's 5.21 TB per day in each direction, not including any image, video, or FaceTime data. Wow. So bandwidth. And they have a working business model, in selling hardware with free services. Yeah, it feels like it's been quite a while since last went down. Way to go Apple! I use iMessage almost daily. and most of the time upwards of 20-50 in a day. That is 2 in a row. Seriously? Why that attitude towards WhatsApp. Did one of the founders there hurt a family member? People get so caught up in some sort of weird inexplicable and really irreverent hate or even love of something they don't even know it themselves...but somehow they must do everything they can to stand behind that strong feeling they have for some reason (or don't even have but think they do or should).